Irish folk all around the world will be celebrating an Italian man on the 17th March and it isn’t because Michael Buble’ is coming to town. There are reportedly more Irish in the United States than in Ireland (if you include mixed blood descendants) due to the great potato famine and, well, let’s be honest, Ireland never really solved that becoming a republic thing either. So just remember, when the parade marches off from Liberty Avenue at 10AM, a whole city will be paying homage, not only to a culture and a heritage, but in the name of an Italian man who brought his culture and traditions to the Gaelic people. So who was St Patrick? First of all St Patrick was certainly not Irish in any shape or form. In fact Patrick was born in Kilpatrick in Scotland and not Ireland. More importantly he was of 100% Italian stock. Patrick’s parents were wealthy and powerful Romans, Calpurnius and Conchessa. His father Calpurnius was a ‘Decurio’, or a Roman of high rank who was in charge of the local council or senate of the colony. Patrick was born around 387AD and given the name Maewyn Succa. He was kidnapped from his family when still a teenager by Irish raiders who sold him into slavery. 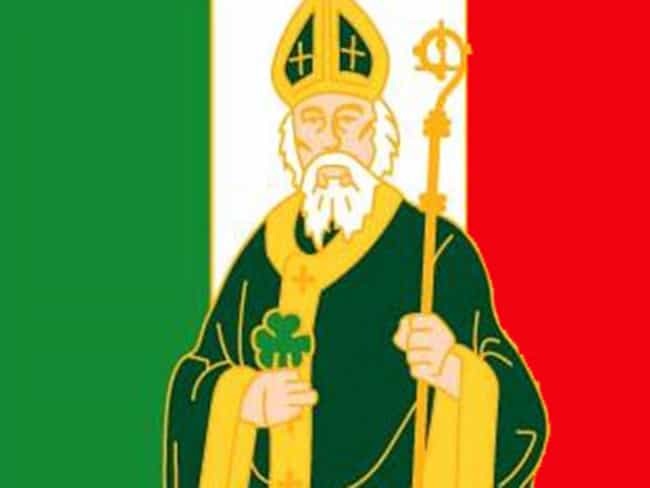 Saint Patrick’s slave master was an Irishman named Milchu who put him to work as a sheep herder. While enslaved, St Patrick turned to God for inspiration. Interestingly Christianity was a minor religion at the time and although there were Christian preachers in Ireland it was Patrick who eventually answered a call from God to run away from enslavement and meet a boat that would be waiting for him. The vessel would take him to the shores of Wales where he would be reunited with his parents. There are many myths about St Patrick however it is accepted that he was very real and his life was very similar to the one outlined here. He, against his parent’s wishes, studied to become a priest and through his acquired knowledge of the Irish language was sent back to the place of his subjection to travel around the country and convert the people of Ireland to Catholicism. He converted the masses for some 40 years and so it is on March 17, 461 that he is believed to have died, never having married and never having had children. St Patrick took his name upon becoming a Priest and although he was believed to have driven all the snakes from Ireland we know that to be a myth as was debunked upon closer inspection upon the Irish parliament. What is true is that St Patrick is related to St Martin of Tours on his maternal side. What is certain is that Feast of Saint Patrick or Lá Fhéile Pádrai is a thinly veiled excuse by many to raise a glass to the heavens. You can’t have that many Irish people without a punchline, however. Perhaps the joke is, that they are raising a glass to a Scottish Born Italian!